Broccoli may not be the most popular vegetables such as spinach or the other. But you know that broccoli is one of the most nutritious vegetables, and even, broccoli called as a superfood. Broccoli is high in fiber, antioxidants, vitamin B, vitamin A, C, K and iron (read more broccoli nutrition facts). Calories in broccoli also includes low, based on data from USDA, in every 100 grams of broccoli contains only 34 calories or 142kJ. Based on calorieking, to burn calories, you simply walk for 9 minutes or jog for 4 minutes, and in fact it only took 3 minutes by swimming. Research conducted in China on 5,000 women aged 20-75 years who were diagnosed with breast cancer found that those who frequently consume cruciferous vegetable group such as broccoli, cabbage, or mustard, the risk of dying from breast cancer is 62 percent lower. Other health benefits, the risk of disease recurrence was also 35 percent lower. 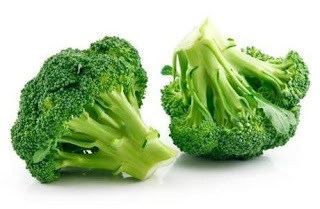 Meanwhile, researchers from Imperial College, London, found the chemical in broccoli and other green vegetables which effectively increases the natural defense mechanism to protect the heart arteries of blockages that can cause heart attacks. In a study funded by the British Heart Foundation, it is known that the compound sulforaphane, can activate the protective protein was not active, to protect the arteries from clogging. The fiber content in broccoli plus content of Omega-3 fatty acids, beta-carotene and other vitamins have contributed to the lowering levels of bad cholesterol while also regulate blood pressure. This is certainly very good to maximize cardiac function. Broccoli contains two compounds phytochemicals called indoles and isothiocyanates. Phytochemicals serves to increase the activity of enzymes, whose role is to destroy carcinogenic agents. Broccoli has anti-cancer agents such as glucoraphanin, beta-carotene, diindolylmethane, selenium and other nutrients such as vitamin A, vitamin C, vitamin E, potassium, zinc and certain amino acids in preventing the growth of cancer cells in the breast, uterus, prostate gland, colon , kidneys, liver and lungs. Anemia due to iron deficiency. Broccoli is a good source of iron, so that it can be used as an effective remedy for anemia. Broccoli contains a mineral called chromium that helps in the proper functioning of the hormone insulin. This is one way to regulate blood sugar levels. Pregnant women need essential nutrients to maintain healthy growth of the fetus. Broccoli contains all the essential nutrients needed by a pregnant woman, such as antioxidants, calcium, protein, vitamins, detoxifier, phosphorus and iron. Children, the elderly and pregnant or lactating mothers are advised to consume enough calcium. Lack of calcium can lead to weakening of the bones, teeth and osteoporosis. Broccoli contribute to bone health because it contains minerals such as calcium, magnesium, phosphorus and zinc. Zeaxanthin is the main ingredient in broccoli that are beneficial for eye health. These nutrients aid in the repair of damage caused by UV radiation and prevent disorders eye conditions such as macular degeneration and cataracts. Broccoli encourage enhancing immunity or immune system to the presence of vitamin C, beta-carotene, selenium, zinc, phosphorus and copper. Broccoli played a role in freeing the body from free radicals and toxins like uric acid. This, in turn, protects the body from toxins-such as ulcers, itching, arthritis, kidney stones, rashes, gout and eczema. Broccoli quite effectively overcome difficulty to defecate because it is rich in fiber. In addition to bind toxins in the colon, fiber also helps the absorption of nutrients from food. Broccoli is a storehouse of vitamins. Vitamin C, beta-carotene and vitamin B complex found in broccoli, which is very necessary to make the skin more radiant. Even vitamin E found in broccoli helped accelerate the development of the regeneration of skin tissue that has died. If we dont cook broccoli in appropriate way, it can cause cancer-fighting substance is lost. However, now there is a sure way to maximize the anti-cancer of broccoli. Scientists from the University of Illinois, United States, managed to find a way to maximize the power of anti-cancer broccoli. The trick is to heat the broccoli in a certain temperature limits so that cancer-fighting substance called sulforaphane is not lost. Discoveries made by Elizabeth Jeffery, making the content of sulforaphane in broccoli increases. Sulforaphane is one of the most powerful anti-cancer content contained within the plant. Works by increasing the content of enzymes in the liver to destroy cancerous substances that enter the body through food or the environment. To trigger the sulforaphane is a bit difficult, because this sulforphane, associated with the sugar molecule through a sulfur bond. When the broccoli enzyme break sugar to release sulforphane, sulfur-binding proteins could spend sulforphane and make it inactive. Although the bacteria in our gut may be issued sulforphane, but we do not have the enzymes to remove it from the body's tissues. Therefore, it is best to obtain the enzyme from the broccoli. To get the maximum health benefits, heating time 10 minutes at 60 degrees Celsius, is the most appropriate to obtain the content of anticarcinogenic. For consumers in the home, preferably steamed broccoli for 3-4 minutes until it feels slightly soft.